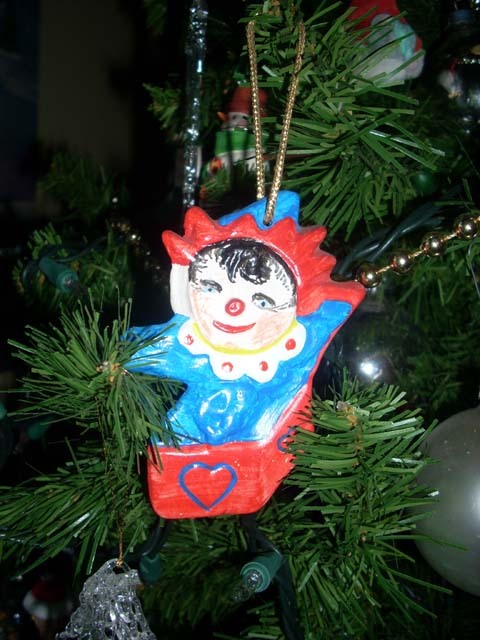 Christmas ornament hand-painted by 10-year-old Stacy in 1975. As I was growing up, a tradition in our family was for my parents to give us ornaments each year from places they had traveled. My husband and I continued the tradition with our children … so we have a number of “special” ornaments that are placed on the tree year after year. This year was no different. As I carefully unwrapped the tissue paper from around one particular ornament, memories flooded back as I saw the hand-painted ceramic decoration for the tree. It was a jack-in-the-box painted in 1975 by a 10-year-old boy named Stacy. I held the ornament in my hand and remembered back to the days when I worked at Children’s Hospital in Richmond, Virginia. Stacy touched my heart more than any other child I came in contact with because of his devilish sincerity. I loved that child. He was from southwestern Virginia, one of many children from a large, down-on-their-luck Appalachian family. As best I can remember, the accident that changed his life occurred when he was playing with his siblings and they tied him to a tree, piled leaves at the base of the tree, and set the leaves on fire. Stacy was horribly burned, so much so that much of both legs and part of one arm had to be amputated. He came to Children’s Hospital for rehabilitation. The patients at the hospital lived in dorms and received daily treatment as well as schooling. Far away from home, Stacy was with us for a long time as therapists, doctors, and nurses worked with him to heal his stumps so he could receive prosthetic devices to help him lead a normal life. For someone who had been through such a horrible experience, he had a devilish sense of humor. He was funny, playful, and almost always in a good mood. Perhaps it was the love he received from the hospital staff as he went through physical therapy, recreational therapy (which was where he painted the Christmas ornament), and the one-on-one education he received from the in-house teachers. I still remember the day he presented the painted ceramic decoration to me. I kneeled beside his wheelchair so to be at eye level with him as he flamboyantly presented it to me … then I took it home to my Christmas tree and, after the holidays, packed it away. Every year since that time it has been placed on my tree. I don’t know what happened to Stacy … I lost track after leaving Children’s Hospital. I have often wondered where he was, how his life turned out, and if he was able to handle the emotional scar of such a life-changing incident so young in his life. I once again placed his ornament on the tree this year and again wished Stacy a Merry Christmas, wherever he is…. Originally published in 2006, this column runs annually as a tribute to a special little boy and our friendship from many years ago…. Tears in my eyes. I’m praying for Stacy where he is and for his siblings. What a load of guilt they must carry. I especially pray for forgiveness and love to be in all of their hearts for each other and for themselves.